'The Bear' is the creative conception of music professor, lead vocalist and drummer Dan Sonenberg, along with three of his former students. Sometimes, music leans a little to the left of what is standard in the local contemporary scene but gives you pause just the same. 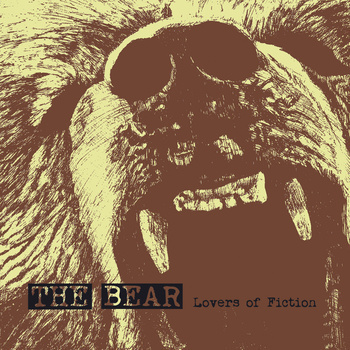 With its new EP “The Bear,” Lovers of Fiction leaves you feeling like you just walked out of an opera house or Broadway theater. A whirling of roller-coaster emotions about to burst inside of your body, you surrender to your dizzy, yearning but full heart. “The Bear” is the creative conception of music professor, lead vocalist and drummer Dan Sonenberg, along with a handful of his former students (Sam Chandler on keyboards; Mark Dennis and Jimmy Dority trading off between guitar and bass). The title tune takes off with gusto. Sonenberg’s willfully slapdash vocals charge right in with a charming conversational bent in the style of some odd character that would make John Waters proud. We are dropped into a scene where a man is recalling the first time he heard about his woman cozying up to “the bear,” and he imagines that other man getting what he wants from her. He is answered by the feminine voice of Katie Chilchrest with lines that chide him for failing to realize why she went down that road. One can almost imagine her eyes rolling as she lilts along, and it’s all the perfect backdrop for a sordid affair. The song proudly exhibits tasty guitar licks, lots of tightly choreographed vocals stashed perfectly in the mix, and a pulsating wallop of a bass line. On “Burn the Town,” the pace is dialed way back. We are treated to a nice intro solo by Dennis that ends with a comic abruptness. Sonenberg delivers a mild and meandering melody in a slightly different voice. In this song, the quality of the recording really shines. There’s a sweet handling of the snare in the middle of the EP. The subtlety and prowess of Sonenberg’s drumming is all so seamless that it could easily be missed by the untrained ear. While some approach their instruments with an “in-your-face” flair, Sonenberg is content to play to his audience at whatever level they wish to meet him. This is an admirable trait. Some of his fills had a forbearance in them that deserve a special mention. While Sonenberg’s voice was unremarkable, it definitely works within the context of his cheery adult tunes. Knowing that he was both singing and playing those specific drum parts, I was beyond impressed. If he can deliver that same combination live, he will definitely have a believer in me. The CD closer, “Everyone at Target Drives a Honda,” gives off a feeling of the aisle lights coming on and the ushers pointing to the exit signs. It’s a fitting end to a very thespian-like collection. I would not be at all surprised to discover that these tunes had become all the rage in some rowdy midnight theater (where all the freaks come out to play) before we know it. Kristin DiCara-McClellan is a Portland freelance writer.